Remakes have always been something of a double edged sword. 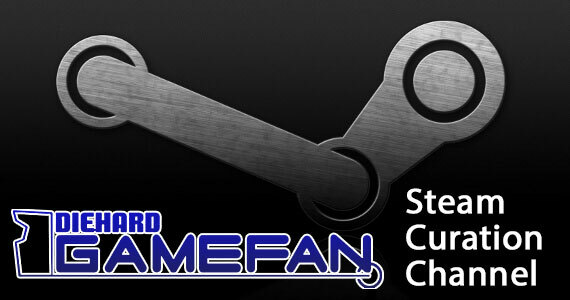 Change too much, and you alienate the fanbase that made the game so popular in the first place. Change too little, and you can bet that you’ll be accused of peddling a quick cash-in on internet forums everywhere. Which is why it’s almost unheard of for a title to be on deck for a remake where you can say “make this as far removed from its original form as you can” and be applauded for doing so. 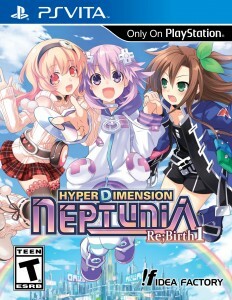 Yet, Hyperdimension Neptunia is one of those games. To its credit, the original game had some genuinely good ideas, not the least of which is the universe in which it exists. Unfortunately, it was bogged down by a poor engine, an uninspired combat system, and some overly obtuse mechanics. Then there was that whole being unable to heal yourself at will thing. It was a complete mess, and all the more reason that this Vita remake is not just a good idea, but practically necessary for steering people towards the better aspects of the franchise. 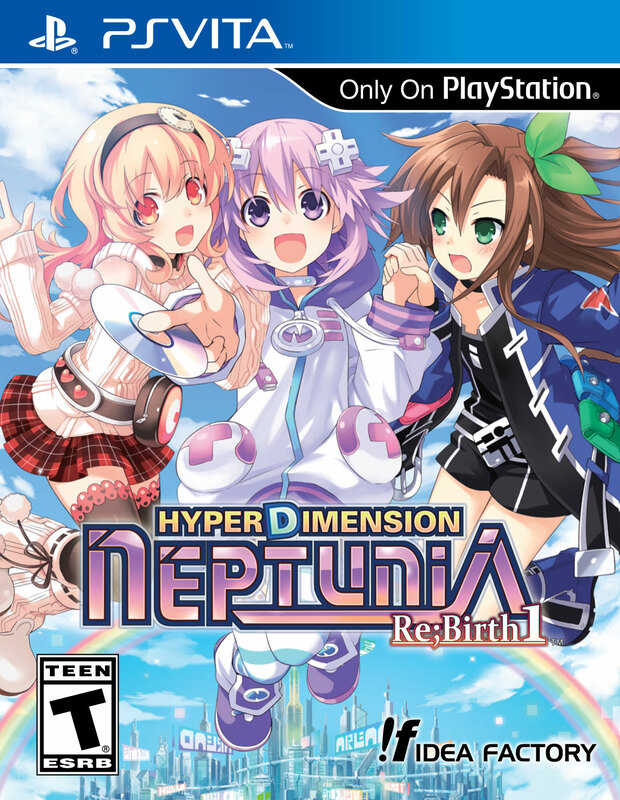 Bottom line: Hyperdimension Neptunia Re;Birth1 is everything the original game should have been. If you’re new to the series, the best way I can describe it to you is by conducting a little experiment. Gather up your game consoles and place them on a flat surface facing each other. Now pretend those consoles are represented by large breasted anime girls who rule as goddesses in their own world and must battle each other for supremacy. 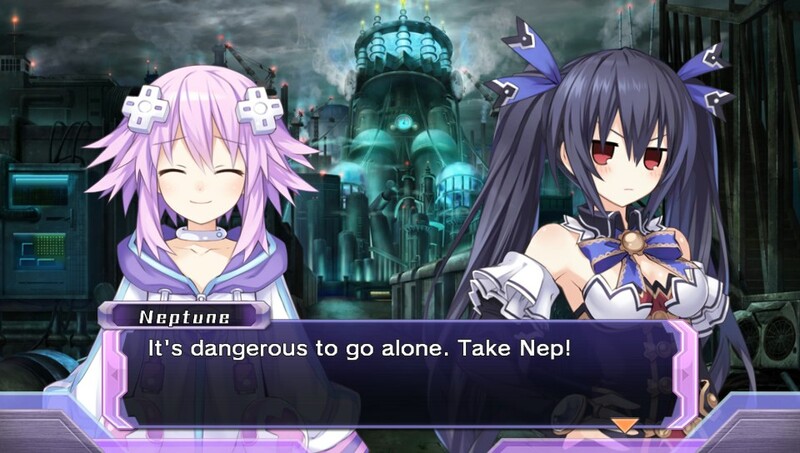 That is Hyperdimension Neptunia in a nutshell. That’s oversimplifying things a bit, but it should at least give you an idea of how crazy a concept these games are. Re;Birth1 in particular, retells the story of the original game and begins with the four CPU goddesses of Gameindustri duking it out. Each one represents a particular console manufacturer and identifies with a specific color: Black Heart (Sony), Green Heart (Microsoft), White Heart (Nintendo), and Purple Heart (Sega). During their skirmish, they decide that in order to end their stalemate, it would be best if they all teamed up to eliminate one of them. Purple Heart ends up drawing the short straw and is soundly defeated, sending her crashing to the world below. She wakes up in her Neptune form with no memory of who she is or what she was doing, though a mysterious being known as Histoire speaks to her to warn of impending danger. The only way to prevent a catastrophe is to collect key fragments, which will subsequently restore Neptune’s memory. She enlists the aid of Compa and IF (who are in-game representations of Compile Heart and Idea Factory, respectively) and begins her search. The game makes many references to various games and game companies and as a result, your enjoyment of the writing will hinge heavily on how well versed you are in the terminology of the actual game industry. Quotes from video games are used liberally, characters like Tekken and Falcom cross your path on a regular basis, and it makes frequent references to old consoles and peripherals. 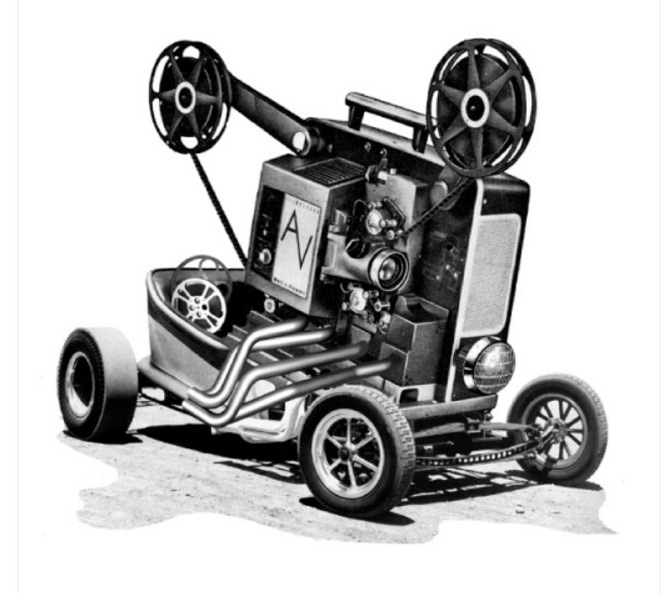 It should be noted that the plot was not carried over wholesale, as a number of scenes have been tweaked. 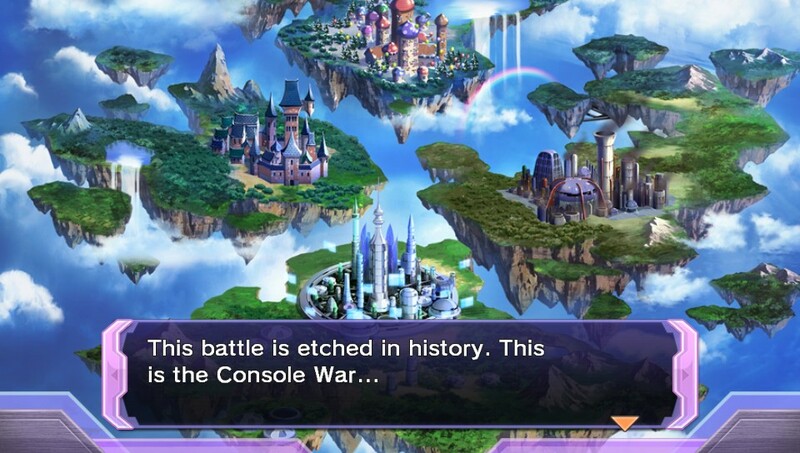 In addition, certain characters, such as Gust and Nisa, have been removed entirely so far as I can tell. There are a good number of situational gags though, so even folks who don’t get some of the references will find the proceedings to be amusing. In fact, the writing is probably the strongest aspect of the game. I didn’t find it nearly as engaging as Victory, but compared to mk2 it’s still a big step up. Neptune truly is the glue that holds everything together. While the entirety of the game has been overhauled in some fashion, one of the first changes you’ll notice is the new world map. All points of interest are sprawled out on one map and all you have to do to visit somewhere is move your 8-bit Neptune icon to it and go. It’s way more intuitive than the 3D rendered map from the original that had to have its locales cycled through one by one before visiting. You can even access any of the countries at any time once they’ve been explored! Combat is still limited to three character parties, though it’s the only thing it has in common with its predecessor. Your characters can move around the map with a hit box in front of them, much like mk2 and Victory, and you can attack as many enemies as can fit within the box. Each of the face buttons represents a new move in the combo. Triangle initiates Rush attacks (for high hit counts), square is for Power, and X is for Guard breaks. Since each enemy has a meter for HP and one for their GP (guard points), ideally you want to decimate their guard first before having them feel the full brunt of your assault. Though if they regenerate their guard too much, you can simply whittle them down slowly. Your characters have a SP meter for using skills that can be activated at will (which means Compa can heal at any time, yay!). Items are also available for use during any character’s turn, or you can use a turn to defend a round. Successful attacks build up an EXE Drive gauge that adds finishing moves to the end of each character’s combo when the meter is full, though the benefit is lost once you leave an area. EX Finishers and combos are configurable from the game’s main menu with new attacks becoming available as your characters level up. 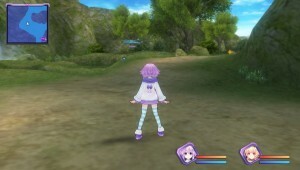 CPU characters, such as Neptune, can activate HDD mode. It uses up a percentage of their available SP (unless for story purposes), but they can inflict much more punishment than previously possible in their vanilla state. 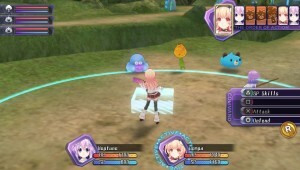 Characters not in use become support members and grant bonuses based on their affection with a particular character, also known as the Lily System. They can also be switched into play in the midst of battle, though if whichever party members are on the field are wiped, it is still a game over. The main gimmick of Re;Birth1 is the Remake System. By earning plans found by talking to NPC’s, completing quests from the guild, or finding them, you can craft new items and new places to explore. In some cases, shops won’t carry specific items unless you craft them, plus it’s the only way for certain areas to open up. 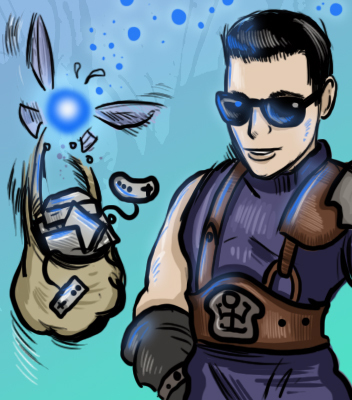 If you want to strengthen/weaken enemies or tweak item drops, that is well within your power to do too. Once crafted, these options can be toggled at will with available memory space permitting, so it acts as a sort of in-game debug system. It’s a good thing too, because the game is downright punishing otherwise. Not that the Remake System helps too much with that; I found the difference to be negligible when opting to power down monsters. In some instances, your enemies will catch a virus that will power them up immensely and will spread to the other monsters if you don’t put them down quick enough. And since the run option fails more often than not, death is always one unlucky battle away. Save points are scarce during exploration, which I thought to be particularly alarming for a portable game. It’s further compounded when faced with multiple boss battles in a row. There was one area I visited that locked me inside with no place to save and three consecutive fights without a chance to regroup. And these things happen very early on in the game. Game balance seems to be disproportionate as well. One level can spell the difference between total annihilation and a cakewalk, which makes the tougher battles less about strategy and more about leveling up enough to brute force your way through it. I hope you like grinding. It isn’t just the balance that suffers in Re;Birth1. I’ve noticed entire areas that are copy and paste jobs with one another filled with enemies that are in some cases just palette swaps of each other. Even worse, I went back and fired up Victory after a severe case of deja vu, only to realize that some areas were lifted almost completely intact from that game. So not only are areas copied from each other in game, they’re copied from previous games! This wouldn’t be so bad if they were interesting places to visit, but most are rather bland locales populated with caricatures of Dragon Quest slimes and Pac-Man ghosts. At least there are a lot of places to visit and a good number of quests to do within them. 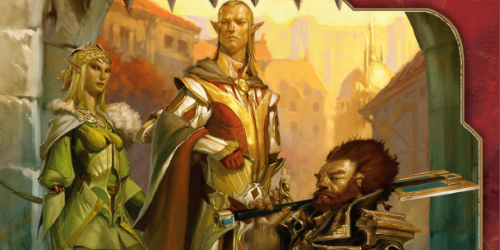 You can accept quests from the Guild in any city and you’ll be sent on a range of missions from slaying a certain number of monsters or bringing back items. Doing these ups your shares in a certain area, plus rare items can be earned. Some are repeatable, giving you a secondary objective for one of the many grind fests you are likely to have. There are rewards that come in the form of discs as well as chips to place within them to boost your characters even more. Their equipment and appearances are customizable to an extent and new stuff pops up in the stores all the time. 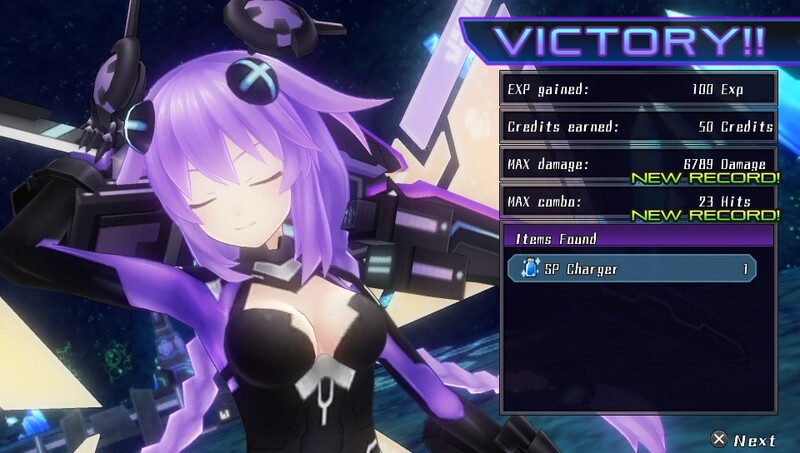 The CPU’s in their HDD forms in particular have the most amusing new outfits. Re;Birth1 doesn’t share in the framerate issues that its predecessor had, instead operating quite well within its engine. The game simply looks great on the Vita, with the in-game models moving rather fluidly and the artwork looking the best it possibly can. The soundtrack contains a lot of familiar tunes, though it seems a bunch from the original HDN got dropped. Neptune and co.’s English cast are on point per usual too, though the Japanese track is available if you fancy yourself a purist. 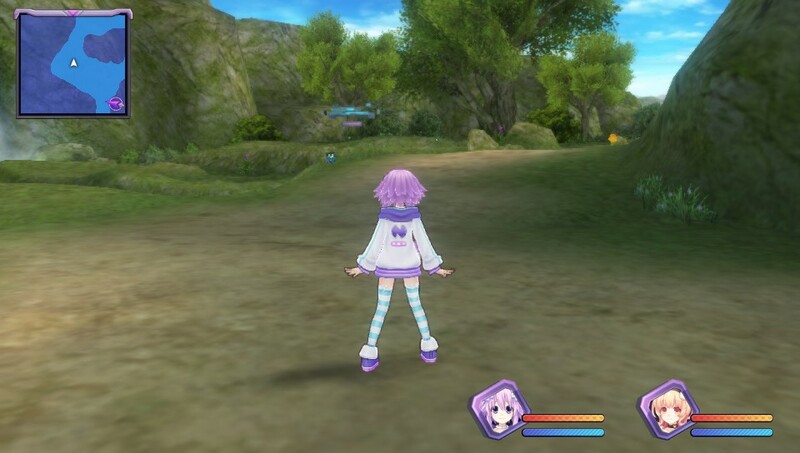 The Hyperdimension Neptunia games have always offered a ton of potential, but for all of the things that have been improved over the years, there always seems to be one or two things holding it back. Victory is the closest the series has come to getting it right, and Re;Birth1 was the perfect opportunity to capitalize on its shortcomings. Sadly, it finds itself mimicking Victory TOO much to the extent that it still believes grinding levels is a suitable replacement for strategic boss battles. Even so, it’s a remarkable improvement over the game it’s remaking and a solid entry into the franchise as a whole. It’s still not to a level where I can say just anybody can play it and enjoy it, but existing fans are absolutely going to love this. Hyperdimension Neptunia Re;Birth1 is a game where its subtitle speaks the truth of what to expect (minus the weird use of the semi-colon). Where the original game in the franchise is widely regarded as one of the worst, this Vita remake rises from the ashes and aims to retool the experience to make it more in-line with the rest of them. And to that end, it succeeds. The game looks and sounds fantastic, dialogue is humorous, and the combat system is much improved (and a lot of fun to boot). 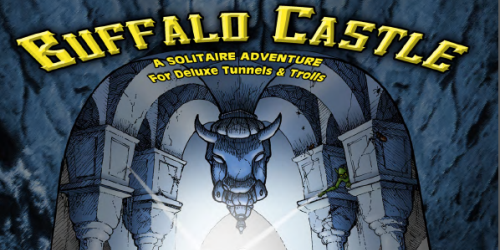 On the other hand, it’s scarce on save points for being a portable game, its quests and locales are copied wholesale from itself and other games, and it forces you to spend a disproportionate amount of time grinding levels as opposed to, well, anything more interesting than grinding levels. Fans will absolutely love this, as none of the downsides I’ve mentioned are anything new. For everyone else, it comes down to how much the story and combat eclipses the other negatives. If nothing else, at least try it out. 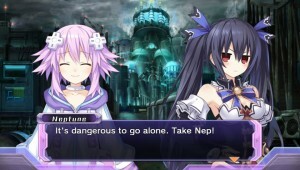 Nep-Nep will love you for it.